The number of calories in nuts are very high as 50% of the nuts weight is oil, and oil contains up to twice the calories when compared with protein and carbohydrates. 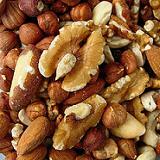 Nuts are a great source of protein, essential oils and fiber. Due to their high calorie content, people following low fat diets choose to avoid nuts and miss out on the important health benefits of nuts. Even though they are high in fat, the healthy polyunsaturated fat in nuts is believed to be good for the heart and lowering our levels of cholesterol. There are more than 300 varieties of nuts and we've listed some of the more popular varieties below. When purchasing them, try and buy them fresh instead of the roasted versions cooked in vegetable oil and covered in salt. You can always roast them yourself, as roasting is thought to add more flavor. The calories in seeds are similar to nuts. Again purchase fresh, but consider popping some in a frying pan and gently warming them. Delicious! Follow the links to understand each nut or seed in more detail. Where possible, we've broken down the fat content so you can compare the healthy fat versus saturated fat.